The Pilgrim fathers brought the township form of government to America in 1620. This unit of local government eventually spread as far west as the Rocky Mountains. Today, it is found in 22 states, known as the town or township. In Ohio, the townsihp predates our state government. The townships' size and shape were determined by the Congressional Acts, which established the various land grants. Within each of the Ohio land grants, Congress set aside sections of land for the use of schools and the support of religious institutions. As the Ohio Territory became populated, it was only natural that the surveyed townships should become the basic unit of local government. In 1804, the elected officers of a townsihp consisted of three trustees, a clerk, two overseers of the poor and a sufficient number of supervisors of highway, in addition to justices of the peace and constables. A township treasurer and assessor were later added. In the early years of statehood, Ohio township government cared for the poor, maintained the roads and preserved the peace. The care and maintenance of the township road system is the largest function of townships today. Today, just as in 1804, the township is a politicial subdivision of the state. To keep pace with the demands of changing times, the functions, duties and obligations of the township have changed over the years. Demands for increased or different services have prompted the state legilature to grant Ohio's 1,308 townships the authority to fulfill these changing needs. Townships receive revenue from local property taxes (although raises in property tax must be approved by voters) and from gasoline and motor vehicle license taxed as well as local government money from the state. This historic homestead is located in Camp Dennison at 7567 Glendale Milford Road. Owned and operated by the Ohio Society Daughters of the American Revolution, it is open May through October on Sundays, 1-5pm. The following information is from their website. This is a great place to see history - so plan on visiting. In 1794, Christian Waldschmidt, a veteran of the American Revolution, moved his family to a site on the Little Miami River and built a new community called New Germany. In 1804, he built his home, which included a store. Waldschmidt was a businessman and encouraged new settlement, staffing a church and helping to found a school, and beginning industries vital to the survival of his new home, such as Ohio's first paper mill, a cooperative distillery, wooden mill, sawmill and a blacksmith shop. During the Civil War, the house and surrounding grounds were part of Camp Dennison, used primarily as a gneral training center, recruiting depot, and hospital post, and named in honor of Governor William Dennison. The main house, now known as Waldschmidt House, served as the headquarters for General Joshua Bates. Over the years, the house fell into disuse and near ruin. In 1941, Mr. and Mrs. Chester Kroger of Cincinnati, who had purchased the property, gave the house to the Ohio Society Daughters of the American Revolution (OSDAR), and donated $5,000.00 to start the restoration. Immediately following WWII, OSDAR began the restoration. In 1953, the house was dedicated and opened to the public as a museum. OSDAR purchased adjoining property, including a smaller fieldstone house that Christian Waldschmidt built for his daughter when she married. This house was used as a guard house for Camp Dennison during the Civil War, and was restored and opened as the Camp Dennison Civil War Museum in 1998. The Ohio Society continued to collect objects of interest to the period. In 1989, the Ohip Society completed the construction of the Memorial Barn, honoring the Bicentennial of the Northwest Ordiance. It now houses an extensive collection of primitive stone cutting and farm tools, as well as a restored Conestoga wagon. The Memorial Barn is used for meetings and other programs of the OSDAR. The Christian Waldschmidt House is considered one of the best examples of Pennsylvania Dutch architecture west of the Alleghenies. Since the opening of the house, DAR members have reserached and collected pieces of early Americana, and the furnishings include many original pirces used by the Waldschmidt family. Criteria for acceptance of items as gifts to the house are: 1) prior to 1831; 2)Civil War period relating to Camp Dennison; 3)any artifact to Christian Waldschmidt or his descendants. Interestingly enough, this area has had a number of names and this short history will give you a glimpse of how significant this small community has been to the State of Ohio and Hamilton County. Waldschmidt completed his large stone home in 1804. This house, the smaller stone house (probably built for his daughter) and a millworker’s house still stand on SR126. Waldschmidt redirected the nearby Little Miami River via a millrace and built a sawmill, his first industry. Soon he was not only sawing wood, but had a gristmill, a fulling mill and a large paper mill. He supplied paper for the Cincinnati newspapers and his establishment was the largest in the area. Waldschmidt died in 1814 and he is buried in the Waldschmidt cemeter. The Waldschmidt industries were taken over by his son-in-law Matthias Kugler. Gradually, Kugler moved the businesses to Milford and when some mills burned in 1848 they were not rebuilt. The Little Miami Railroad, which began operating in 1842, had a negative influence on the Waldschmidt-Kugler holdings. The railroads opened up commerce to many communities and competition was too great for the businesses to continue. In 1861 General Rosecrans selected the area as a recruitment and training area for Union soldiers. Germany and the surrounding area were chosen because of the proximity to the little Miami Railroad and the closeness to Cincinnati (17 miles). It was thought that Cincinnati needed to b e protected from Confederate invasion. 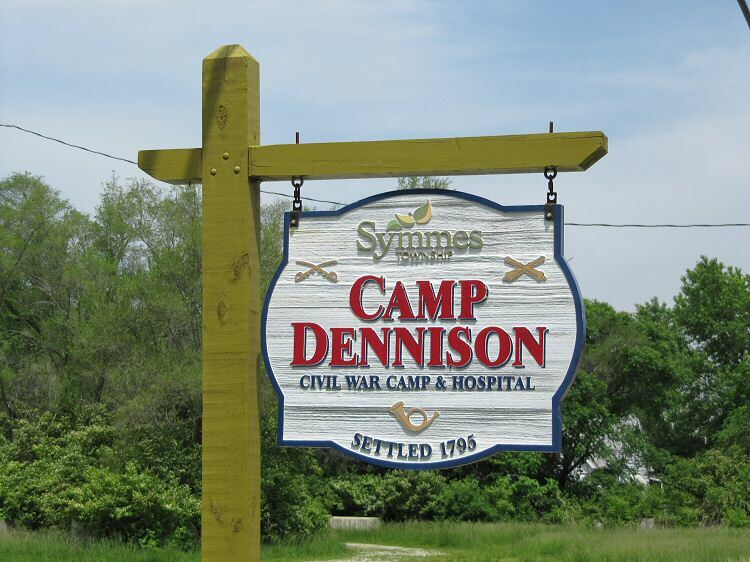 The camp was named Camp Dennison, after Ohio Governor William Dennison, who was governor at the outbreak of the war. Thousands of Union soldiers were mustered in or out of service at Camp Dennison. As casualties of the war mounted, a hospital was established. The hospital had over 200 beds in 70 wooden barracks. Many soldiers died at the Camp Dennison Hospital. The Waldschmidt Cemetery served as the temporary gravesite for 340 Union soldiers and 31 Confederate soldiers who were prisoners of war. These soldiers were moved in the late 1860’s to Spring Grove Cemetery or Camp Chase in Columbus. The Camp was disbanded in 1865. After the War it was thought that the area could be a suburb of Cincinnati. Residents could commute to the city by railroad and there was abundant material for houses from the camp barracks. Soon after the war, a number of homes were built; subdivisions and roads were laid out. Camp Dennison did not seem an appropriate name and the community’s name was changed to ‘Grand Valley.’ This was short lived however as the railroad refused to change the name on the schedules. So Camp Dennison it has remained since 1861. Up until recently Camp Dennison had its own Post Office which was established during the Civil War. The Waldschmidt houses are on the National Register of Historic Sites and are available for tours on Sunday, May through October each year. The Waldschmidt Cemetery has undergone a renovation and rededication. The railroad, which had such a significant impact on the growth and decline of the area, is now a popular bike and hiking trail. Worshipers first met in the cabin of local resident Henry Stroman in 1806. There were no pews, no choir and no organ. Services rotated between homes in the community and the school for the next 40 years. In 1845, a permanent church was proposed. It was located on the east side of Glendale Milford Road, just below the Camp Dennison Cemetery. Local resident, Mathias Kugler, donated the land, contributed nearly half the cost and supervised the construction. The simple building was constructed for $1,000.00. In 1861, as the country entered into civil war, the Union Army established a military training and hospital in Camp Dennison. Since it was right in the middle of the camp, the church took on a new role. A group of Sisters of Charity, led by Sister Anthony O'Connell, came to the camp to nurse and cook for the sick soldiers. The Sisters tookup residence in the church. Another member of the group, Sister Bernadine, described how they had used the pulpit for a storeroom, boards for tables and the floor for the rest. ; Sister O'Connell and her group went on to care for injured soldiers in the field for both the Union and the Confederacy. After the war, local residents moved back into the church. By 1868, proposals to move the church to a better location were underway. In late summer, the church was taken down piece by piece .. moved .. and rebuilt at its present location less than a mile away but on higher ground. As part of the move, 10 feet were added to the church's length and a cupola was built to house the bell. Total cost of the move was $850.00. This is one of three historic cemeteries owned and maintained by Symmes Township, Hamilton County, Ohio. This cemetery is located on State Route 126 (Glendale-Milford Road) near the intersection of Lincoln Road. This cemetery, also known as the Waldschmidt Cemetery, is closely linked with two periods in Ohio history. The original settler of the Little Miami River area, Christian Waldschmidt, is buried in this cemetery. Waldschmidt was born March 23, 1755, in Lancaster County, Pennsylvania and journeyed to the Little Miami Valley in 1794. Prior to settling in the Little Miami Valley area in 1796, he bought a large tract of land in 1795 from John Cleves Symmes. Christian Waldschmidt and his family are buried in the cemetery on land that was part of his original holdings. settlement as "Germany." On these maps the cemetery is titled a "Graveyard Lot" or "Cemetery" The layout of the earliest (front) portion of the cemetery shows side by side gravesites, very small by today's standards. The early settlers and family members may have been buried side by side, as they died, as this section of the cemetery has few grave markers with names, only field stones marking a space. ; And many of these stones are missing or buried below the surface. Christian Waldschmidt is buried in this early section, but toward the back part of the area. It would seem that many early settlers died prior to him, but we do not know their names. So we assume that this land, though owned by Waldschmidt, was informally given by him to be used as a cemetery for his family, neighbors and friends. The historical significance of this cemetery is also closely tied to Ohio's participation in the Civil War. Much has been written about the great Union camp, Camp Dennison, and its importance to the Union war effort. Camp Dennison was established in 1861 by General Rosecrans to be a recruitment or rendezvous area for Union regiments. As the war progressed it also was a hospital and treated both Union wounded and Confederate soldiers who were prisoners of war. The Waldschmidt home was used as headquarters for the camp. Thousands and thousands of men passed through Camp Dennison and many died here. Further confirmation of this is a deed from Rebecca E.J. Kugler, widow of John Kugler, to the United States of America, dated June 24, 1875, and recorded in Deed Book #428, page 297 in Hamilton County, Ohio. This deed postdates the Civil War and the disbanding of the camp and hospital.Rebecca Kugler for $1.00, is conveying a portion of the farm of the Estate of John Kugler formerly forming part of the military reservation. The land being conveyed abuts the graveyard known as the "Citizens Cemetery Lot". The lot being sold to the United States is about 628/1000 of an acre and "comprises the land containing all the graves of soldiers of the State of Ohio and the USA that died or were interred at Camp Dennison". Kugler, a descendent of Waldschmidt, is conveying the land to be occupied as a cemetery. This is the middle section of the present cemetery. This deed confirms some important information - The cemetery is known as a "community" cemetery, not a family plot; Civil War soldiers were buried in this cemetery during the Civil War and the area used for these burials was the center section of the cemetery. The area was used without title during the war and not officially conveyed to the government until 1874. The next factual reference the Township has discovered is a deed dated November 9, 1922, deeding for $1.00, a half acre of land from John G. and Susan M. Ragland to the Symmes Township Trustees. This land is the back portion of the cemetery. Also about this time, the cemetery is platted for the Township Trustees by George F. Robinson. This plat notes two items of interest - the cemetery is named the "Old Germany Burying Ground" and SR 126 is call the Miamiville and Milford Road. On May 3, 1939, there is another reference to the middle section of the cemetery (land deeded by Rebecca Kugler). The Symmes Township Trustees had purchased from the United States Army, for $10.00, the title to the "Soldiers Lot" at the Camp Dennison cemetery. Headstones in this area show burials prior to 1939, so it's likely that by this time the Trustees had assumed responsibility for the cemetery and were just realizing that the Township did not have clear title to this section. Of course, by this time the Civil War soldiers who had been temporarily buried in this cemetery had been moved. On May 26, 2002, the Symmes Township Historical Society dedicated a Historical Marker for this cemetery. Waldschmidt Cemetery is located on land purchased from former New Jersey judge and Congreeman John Cleves Symmes in 1795 by Christian Waldschmidt, one of the first settlers in the Little Miamit River Valley. Waldschmidt, from Lancaster, Pennsylvania, was a veteran of the American revolution, and he and his family are buried here. During the Civil War this area, names for Governor William Dennison, served as a training site and hospital for the Union effort. A portion of the cemetery was the temporary inerment site for 349 Union soldiers and 31 Confederate prisoners of war, most of whom died at the camp hospital. On July 4, 1869, the Union soldiers were moved to Spring Grove Cemetery in Cincinnati, About the same time, the Confederate soldiers were reinterred in Chase Cemetery in Columbus, Ohio. In 2003, Symmes Township purchased 23+ pristine acres located on Lebanon Road from a private resident for the Township park system. Included on this property is an imposing 2-1/2 story white columned Greek Revival home built by Dr. Charles C. Meade about 1900. The house and seven acres are leased to the Cincinnati Horticultural Society. Visitors can now enjoy the beautiful gardens. The original homestead consisted of 200+ acres and was the only house at the corner of Union Cemetery and Lebanon Roads. When Dr. Meade built this beautiful house in 1900, the area consisted of farmhouses with substantial acreage. He built the farm with barns, outbuildings and tenant houses. Dr. Meade had a love of horses and used his farm to raise horses for breeding and to train trotters and pacers. A training track once was located on the south side of the property. Dr. Meade was trained as a homeopathic physician at Pulte Medical College in Cincinnati and there is speculation he continued to practice medicine from his home after his retirement in 1905. Dr. Meade lived in the home until 1917 when he sold it and moved to Hyde Park. He died in 1947. The success of his farm made Dr. Meade prominent in harness racing in southwestern Ohio. As a result of his prominence, he was associated with the Hamilton County Fair for many years serving on the Fair Board. This was a prestigious position in the early 1900's. There are many interesting details about the house, including a brick building located a few feet to the south and west of the main house. This building, thought to have been a privy/wash house, contained a fireplace facility that not only heated water, but also heated the building - highly unusual to have a heated privy. Additionally, in the entrance hall there is a built-in bench with a small room to the side. The room, wth a fireplace, can be closed off from the rest of the house. We speculate the bench was Dr. Meade's "waiting area" and the small office his medical office. Progessive for the time, there is a working windmill (still there and operational) that powered a well pump and brought running water into the home. The Charles C. Meade house is significant to the history of Symmes as it was the main house and office for a large profitable and significant farmstead that was developed during a period of transition when the local economy was developing from a strictly agricultural economy to an ever increasing business and industrial economy. The farm was developed as a business enterprise from its inception unlike surrounding family farms. The Meade House is a classic example of Greek Revivial architectural and is the only example in the area. “The first school house was a log building on the south side of Kugler Mill Rd (Galbraith Rd. ), ½ mile east of Buckingham Rd. Its water was supplied by a spring which is still there. Miss Jerusha Jones taught here; we do not know how long the school existed. This information was obtained from Mrs. Jessie Price Lytle, whose father, William Price (Prisch) attended there. The log building on Kugler Road no longer exists. The brick schoolhouse on Lincoln and Clement Rds. now has siding and is not easily recognized as a schoolhouse. It faces the Little Miami Bike & Hiking trail, which was previously the Little Miami Railroad. Area children used the schoolhouse until the beginning of the Civil War in 1861. Landowners living in the area (which then was called Little Germany or Big Bottom) leased their lands to the Government for use as a training area for Union soldiers. Most families moved away during the Civil War years. The following is an excerpt from General Jacob D. Cox, “Reminiscences of the Civil War”. Cox was dispatched by General McClellan to establish the training camp and described the activity at Camp Dennison in April 1861. “my own headquarters were in a little brick schoolhouse of one story, which stood on the east side of the track close to the railway…my only staff officer was an aide-de-camp…he slept on the floor in one of the little aisles between the pupils’ seats.” Obviously the school received some use, but not as a school during the War years. After the Civil War ended in 1865 new homes were built, many with lumber from the camp barracks. Families began moving back to the area and in 1870 children attended a new 2-story brick schoolhouse on Montauk Rd. (now Glendale-Milford Rd). That same year (1870) the US Government approved a post office for the area. The area was now named “Grand Valley” and there were 335 residents. "First Two Story Brick Schoolhouse"
The year was 1863, and construction began in the fall on what was to be the first two story brick schoolhouse in the Midwest. Located on Route 126, the school was designed in a cross construction pattern with gables containing Italianate style bracketing at the corners. The building was not used as a school until 1870, due to the Civil War. It was the third building to be used as a school in the area. It housed students up to the eighth grade. The school had two floors with a winding staircase that separated them. The first level had two rooms with a hallway entrance leading to the stairs. The second floor was used in the early years for the teaching of black children. Part of the upper floor was an auditorium used for assemblies and meetings. In 1939, the building was remodeled converting from stove heat to hot water heat. Additionally, restrooms and water fountains were added. Enlargement of the windows provided extra sunlight for the school. The building was used as a school until 1952, when the last class graduated. It was sold to the Ohio Gravel Company that same year. In 1962, it was converted into a restaurant facility. If you visit the Schoolhouse Restaurant, you will be dining in the original schoolhouse. "Hamilton County's Last Functioning One-Room School"
Sixteen Mile School lies on the east side Montgomery Road, 16 miles from the Cincinnati Courthouse, north of Kemper Road. John Short gave three-fourths of an acre in 1852 for the school and his son added one-half acre in 1878. Except for the time the property was owned by the Sixteen Mile School Board, it has remained in the same family. The original school was a log cabin, which was replaced in 1879 by the current brick structure. In 1931, a second building was added, which expanded the size from 30 to about 65 students. In late 1949, the County Board of Education ordered the consolidation of six school districts, including the Sixteen Mile School, into the Sycamore School District. In January 1952, an article was published in the Cincinnati Enquirer stating that "History To Claim County's Last One-Room Institution." It noted that the main building housed the sixth through eighth grades and the frame structure was used for the younger grades. The toilets were outside and drinking water came from a pump in the schoolyard. The coal stove was no longer used as heat was provided by a furnace. Lunches were brought from home. The school stopped being used as a school in 1952 when the new Montgomery School was completed and absorbed the students of the Sixteen Mile School. In 1966 the Meier family purchased the school and property and the frame building was remodeled for use as a nursery school in 1967. Audrey Meier, a descendent of the Short family, now owns the school and lives in an adjacent house. The Rural Remington Schoolhouse is 100' beyond the intersection of State Rt. 126 and Loveland-Madeira Road. The school was used by the Knights of Columbus for many years, but is once again serving as a schoolhouse and now occupied by the Springs Montessori School. The one room schoolhouse is 116 years old, having been built in 1879 on lots donated by the Humphrey family. The school served grades 1-8 and all grades were taught in the one room by the same teacher. The school was heated with a pot belly stove and drinking water came from a well outside the property. The school expanded to 2 rooms in 1939 and at that time became part of the Indian Hill School District. The school served the area until 1950 when it closed and students were bused to Indian Hill Schools. The front of the schoolhouse has undergone many renovations but if you drive by and look at the side of the school you can see the beautiful 12 over 12 paned hung windows that are original to the school building. The Remington Rural School is located at 9429 Loveland-Madeira Road. The Kansas District School was originally a log cabin on Lebanon Road across from Lindenhall Drive. The school was built in 1863 on land donated by a civil war veteran, Mr. Rowan. This log cabin school remained in existence until 1883 when it burned as a result of boys wrestling and knocking over the pot-bellied stove. It was rebuilt in 1884 at the same location, and part of the old foundation and old well can still be seen on the property. In the 1910s the school educated grades one through eight. Enrollment was 12 to 20 students and they were taught by one teacher. The school was closed in 1932 and abandoned. The property was purchased at auction in 1938 by Jay Leming who converted the school building into a private residence. Mr. Leming was quoted as saying "This place is still all original brick, all around. It was built with three layers of brick. The mortar in the bricks is just like the day they mixed it. It's tough." He also claims that a saloon, Blazing Stump Saloon, was next door to the school. One day a drunk wandered over from the saloon waving a pistol. Shortly after that episode the saloon was closed. This incident apparently led to a state law requiring that no saloon could be located within 500 feet of a school. In 1991 Symmes Township purchased 46 acres of property adjacent to the school for a Township Park. Mr. Leming has bequeathed the schoolhouse to the Township. Next time you entered the Symmes Township Park take notice of the Kansas Schoolhouse which is located to the right of the entrance.